In Part 1 of Becoming a Dementia Behavior Detective, we talked about how observing and logging challenging behaviors can help you discover the reason for distress in a relative with dementia—and then begin to figure out how to make changes that prevent or lessen a challenging behavior. This is a key concept of our book Coping with Behavior Change in Dementia. 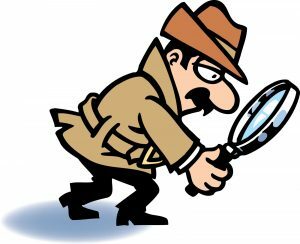 Because people with dementia who cannot clearly articulate their thoughts and feelings use their behavior to communicate, we caregivers need to become detectives. Like detectives, we need to observe, investigate, and draw conclusions from what we are seeing. We watch a challenging behavior over several days, taking notes in a simple record or log, to try to identify a pattern that helps us figure out the cause. Previously we discussed the story of George and Ann. Ann often gets agitated in mid-afternoon, frustrating both George and Ann and making them lose their tempers. To help understand what was happening and try to see whether he could devise a solution, George began to take notes on where and when the behavior occurred. Saturday 3:00 I was with Ann Watching TV with me in my office while I read a book. Anger and agitation I yelled at her. She yelled back and threatened to hit me. Sunday 2:00 I was with Ann We were in my office. I left Ann sitting on the sofa and moved to work at my desk. Ann became upset and started pacing. I ignored her, but Ann became more agitated and started crying. Monday 4:00 I was with Ann I was taking a nap in our bedroom. Ann became upset and yelled at me because I would not get up. I asked Ann to lie down with me. I stroked her back and she calmed down for a short while. From George’s behavior log, we were able to come up with a number of possible causes for Ann’s behavior and strategies for responding to it. Violent or disturbing TV shows may be one reason. Based on what we know about a typical day for Ann and George, she may be hungry, or not be eating enough protein. Perhaps George needs to limit Ann’s caffeine intake, or give in and give her more sugar! George might try working in his office in the morning when Ann is calmer. If he can focus on his work, he may have more patience for Ann because he is not worried about getting his work done. He could hire a companion for Ann at that time of day. Ann’s behavior is understandably stressful for both of them. He could ask a friend or neighbor to be with Ann. Ann might enjoy attending a day program where she could be with other people and participate in activities. If all else fails, George should consult a doctor. If the level of agitation continues or increases, and puts both Ann and George at rick, it may be time to talk about a medication to reduce the agitation and anger. If keeping a log is not feasible for some reason, or if it doesn’t yield clear results, find someone to help you systematically analyze the behavior. A friend, family member or a health care professional may be able to assist with this. Your local Alzheimer’s Association chapter may have someone available who can help. The more minds the better! Brainstorming with others can help identify many possible causes and solutions. Some, of course, you will rule out, but your list will lead to a number of strategies to try. When you sit down together, make a list of possible causes of the behavior. Think broadly. Perhaps it would help to categorize causes. In this story, George could sort the causes into physical, emotional, and environmental causes. We firmly believe that many of the most challenging behaviors may be minimized when caregivers learn how to identify root causes and try strategies that are known to help some people with dementia much of the time. For us, medication is the last resort. By becoming a Dementia Behavior Detective, you will find strategies that work to prevent or lessen the behavior—and lessen your relative’s distress as well as your own.